"So what do you think is your crime?" I was asked by one of my interrogators while I was telling him about what I did as a blogger, an advocate and an activist. Later on, after I was allowed to meet with my "collaborators" according to my prisoners and asked each other, we found out we were all asked this same question “what do you think is your crime”? This describes the overall outcome of our interrogation. Since they couldn’t figure out what our supposed crime was or what law we were suspected of violating, we were asked "So what do you think is your crime?". The interrogation was not to ultimately find out whether we are innocent or not but to find anything that could be a crime. Some have asked why the Government has tolerated Zone 9 for 2 years, because tolerance isn't in its nature. Ethiopia's Freedom of expression, as I have imagined, has easily gotten us arrested, interrogated, alleged with being a member of Ginbot 7 (OLF as well) and is prosecuting us. The rest will be left for the court to deal with in time. Many people who have known Zone 9 in the past could be confused and would demand an explanation to figure out why we’re being prosecuted. This is what has forced me to respond in this short piece. How did we get here? What is our imprisonment like? How was the interrogation? Are we really members of Ginbot 7? If not then why were we arrested? Will we be released soon? Whether a scholar or a layman, anyone who writes about Ethiopian politics will always have a fear of being imprisoned. That is why, I think, Professor Mesfin wrote on one of his books that the people of Ethiopia are of three categories, the imprisoned, the imprisoned and released, and the one that is waiting to be imprisoned. In fact everyone that has refrained from expressing ones views in fear of persecution is technically imprisoned and can easily put all the categories into one, the imprisoned. Two weeks after we officially started blogging as Zone9ers, we had to set up a second blog after our first one was blocked in Ethiopia. We knew one day that it will be us who will be locked up behind bars. We were under surveillance, have been receiving threats and signals that indirectly revealed what is to come. Though our arrest caught us by surprise, it was not unexpected. 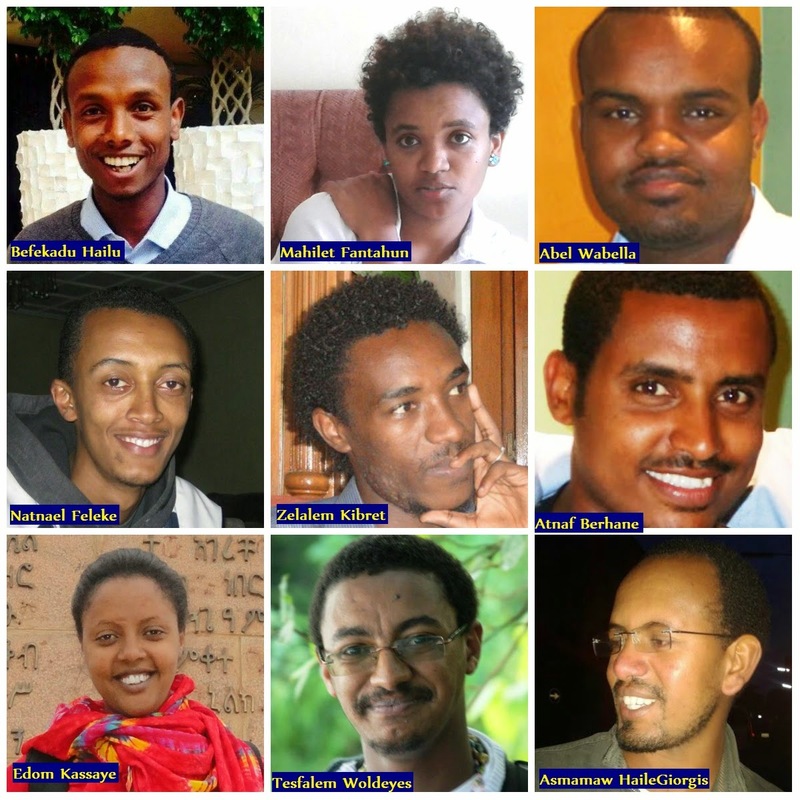 Following the surveillance, the arrest targeted six members of Zone9 and three journalist who are our close friends. The arrest of the three journalists has been a complete surprise at least to us. Later we were able to understand their arrest in relation to their friendship and closeness to us was well orchestrated as a sweep up operation. All of us except Asmamaw were arrested on Friday April 25th at 5:00pm from different locations at the same time. Asmamaw was arrested the next day on Saturday. They were also conducting the search warrant in our houses after it expired at 6:00pm.The brutal and unjust treatment started immediately after our arrest. For anyone who knows about the notorious Maekelawi, finding oneself in its compound sends shocks to the heart. In the contrary I was a bit optimistic and knew my friends have felt the same the minute they stepped in because one we are bloggers not soldiers or spies and two I had a foolish impression that there is better human treatment than the bygone era of the past. On the first day an inmate conveyed to me that I am in the worst part of Maeklawi called Siberia. Later it took me less than a week to admit what was written in the report “They want a Confession” by HRW was all true. Interrogation in Maekelawi is more brutal than technical. The interrogators spend more time trying to show their skill than actually interrogating and attempting to find out more. If that doesn’t work they will slap, kick and make the prisoner perform tough physical exercise. These are among the few things that I went through in the hands of the five interrogators and also what I heard from other inmates. Some are made to stand naked and do sit ups. Other inmates told me that they have gone through even more brutal punishments like hanging upside down and removing nails but that was before they were moved to Maekelawi. Among them were students from Haromaya University Intriguingly the confession the prisoners give after such punishment was brought to Maekelawi as an evidence to their alleged crime. Similarly these prisoners had their eyes covered so that they would not know where they were. This reminds me of DERGs Bermuda - another notorious place of interrogation. Hence we gave our confession after being humiliated, insulted and brutally treated under the roof of the horrific Maekelawi. Our confession was 100% untrue. When the brutal force used against us became unbearable we admitted to crimes of “Conspiring to instigate violence”. While taking notes they were making sure every word we spitted out was twisted as “self-incriminating” to help with our prosecution. We argued to the best of our physical and mental abilities and when it became impossible we signed the documents, they beat us to sign these documents. The only person who managed to withstand the beating was Abel, who refused to sign by saying “I will not sign anything other than my own confession". The important thing that we understood was that Maekelawi’s interrogators are experienced in brutality than fundamental intelligence. I always had an impression that the police will acquire all the relevant evidence and then interrogate the prisoner how and why they carried out the crime. Thanks to Maekelawi now I understand that interrogation starts with “What is the crime you committed? Tell us!” Maekelawi style. “I am innocent” will always fall on deaf ears. Once you are arrested, you must admit to a crime or else they will bake one for you. When I think about it now, Maekelawi investigation center needs a fundamental restructuring due to two important reasons. 1. The interrogation technique (as I have understood from our case) is more about carrying out an order, meaning it is not strategized or determined on case by case basis. 2. The interrogation is not knowledge or intelligence based. And this will endanger the security of the country as such approach will certainly fail to gather, capture or control real threat. This problem occurs because police investigators are recruited more based on loyalty and a willingness to take orders than carrying out skillful investigation. In the interrogation process what we were forced to sign was an admittance to inciting violence through the articles we have written, the campaigns we conducts, the trainings we took or the trainings some of us gave hence our expectation was to be charged with crime under the criminal code 238 and 257. Unfortunately we were charged with Terrorism, a crime that could get us 15 year to life sentence. This actually made me laugh. The evidence that were brought against us were the articles we wrote, the campaigns we conducted, the press releases and training manuals. In addition to these were documents of Ginbot 7 and OLF which they claimed they found under our possession. First evidence was Ginbot 7’s newsletter that was sent to Natnail Feleke in September 2009 that is way before the Anti-Terrorism Proclamation was set in motion and way before Ginbot 7 was convicted as a Terrorist organization. The second was a Ginbot 7 recruitment document claimed to be found in Soliyana’s home in which her mother refused to sign accepting the document was found in the house. What I remember, before my arrest was Soliyana’s twitter bio read “No for war”. The third evidence was OLF’s program that was found on Mahlet’s computer. Apparently there were other Oromo Party programs found as well but were not presented as evidence. Neither was she asked why OLF’s or other Oromo party programs were found in her computer while she’s being prosecuted for possessing only one? Needless to say, having these documents does not and does not mean working with them or agreeing with what they do. This wasn’t clear to our interrogators but I am sure our compatriots and friends will definitely understand. The other laughable charge was that states “they have accepted and distributed among themselves 48 thousand Birr(Eth) that was sent through Natnail Feleke”. Though the charge is written so as to create an impression that the money was sent from the so called “Terrorist Organizations, the bank receipt shows that the money was sent from Article 19. We explained to the interrogators that the money was sent to an imprisoned journalist and her family. They still made it part of the charge not because they believed we are criminals but rather due to their evil intention of getting us punished or use it to buy time during the series of court appearances. The donkey said, “Look, if you want to attack me, stop looking for excuses.” Such is our story! The police arrested us with no evidence. They did not even know more than our names. By the time they arrested us, they had not even read a collection of our writings that we sent them through one of their security agents. And I believe that ninety percent of the "document" evidence the police presented against us now are our own writings which we gave them in good faith. In our interrogator’s statements, we have seen their desperate interest to make us criminals. As we guessed it, maybe they do not want our presence on social media, at least until the upcoming 2015 election. May be they have not found other options. So far, we have witnessed how the investigators are biased towards the ruling party. What follows is for us to publicly test the justice system. For now, however, could we be free soon? I will say we’ve theoretical, not legal options. When EPRDF (or the police that EPRDF orders) arrested us, they did not have a "beyond reasonable doubt" evidence, as the lawyers would say. They only hoped to find a mistake, any mistake. However, they have found nothing that could stick and make us criminals within the anti-terrorism law which is already criticized for being a potent tool for suppressing political opposition and independent criticism of government policy to mean stretched to its limit. However, the fact that they were not able to find evidence did not prevent them from their objective of charging us. The fact that they did not even write a coherent statement by the time they appeared in court to charge us is an evidence that they do not have a valid suspicion or evidence. Yet, I do not believe that they will release us soon. Why? 3rd. Even though they believe that we have no intention or the capacity to instigate violence, they know that we are strong critics of the ruling party and they do not like it. For this reason, they want us to suffer the bitter reality of detention. At least serving time and following our case in court. It's as if being released after finishing our sentence. Divine 9, you are persecuted for writing, for promoting for peace. This reminds me of Christ's persecution... all he was trying to do was show and teach people the true way to live and the Pharisees, hungry for power, overfilled with resentment, devised evil in their hearts to kill the PeaceMaker. The interrogators, needless to say, do not know what they're doing. Blind, stone-hearted, they are under their own oppression. One day they will learn compassion. Do not lose hope. Keep writing. Hold mercy and love within your hearts. May God be with you Zone 9ers . We also care about the truth and freedom of speech you preached. We are your supporters and we will spread the message you stand for .